The ‘Light the Trail’ event is promising to be something special in 2019. Riders will be using the Axedale to Heathcote section of the O’Keefe Rail Trail for event in The O’Keefe Challenge’s weekend of activities, which also includes the iconic Mandalay Resources O’Keefe Marathon and other events. The Light the Trail ride destination will be Heathcote, with the end of the ride seeing riders roll into Palling Bros. Brewery on High St in Heathcote. This will be a unique experience, with riders cycling from Axedale to Heathcote guided by their bike’s own light, and possibly by the moon also! Riders will be encouraged to also ‘light up’ their bike, as well as themselves! At the event’s finish location, Palling Bros. Brewery, prizes will be awarded for ‘Best Illuminated Outfit’, ‘Best Lit Bike’ plus an ‘Encouragement Award’ for those who have demonstrated the spirit of The O’Keefe Challenge. Date: Friday, 26 April 2019. 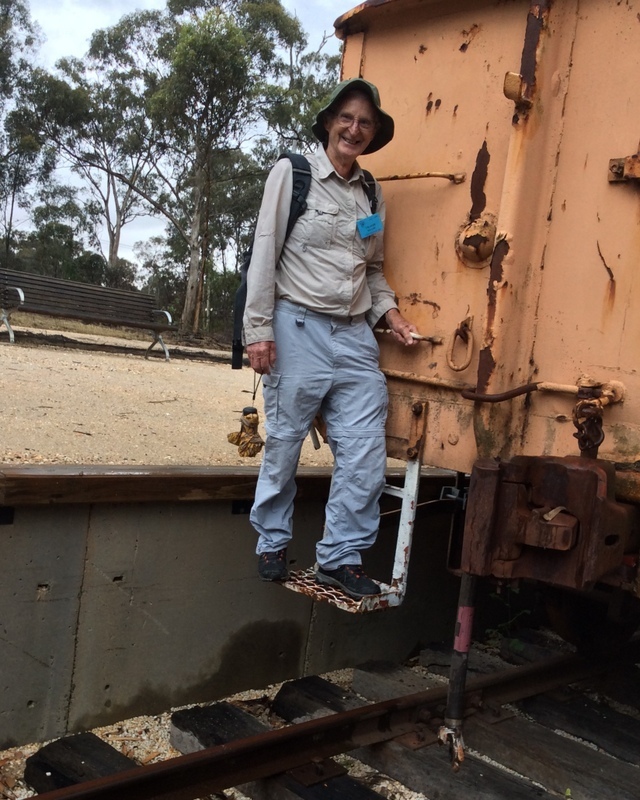 The O’Keefe Rail Trail attracts all age groups, so it is no surprise that the U3A Bendigo Bushwalking group utilise this popular trail for planned walks. For the unaware, the acronym U3A stands for the University for the Third Age, and it is all about shared learning in mature years. 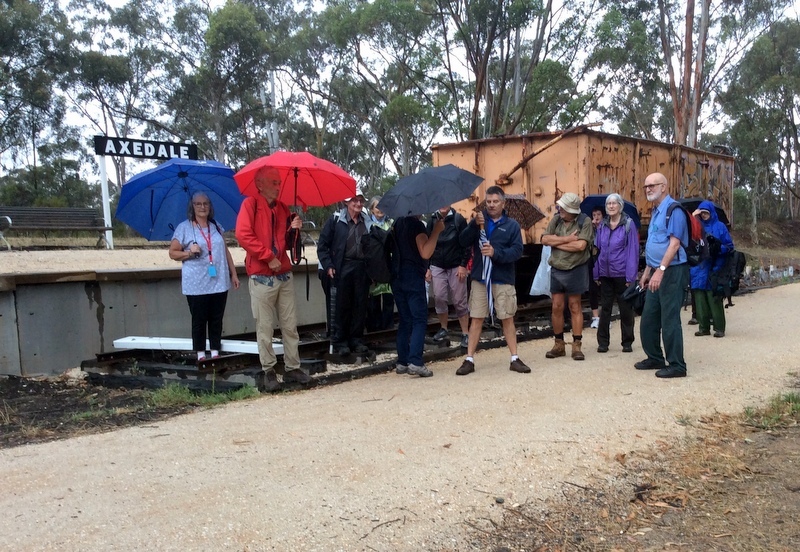 On 13 December, 15 members of the group gathered at the Axedale Park, although stormy weather was threatening their planned walk on the O’Keefe Rail Trail. Not to be deterred, the members set off to enjoy the natural environment that the trail provides. It wasn’t long before the umbrellas were out, as the walkers neared the former Axedale railway station area on the trail. Here an inspection of the historic railway wagon recalled some past memories, such as standing on similar station platforms waiting for a steam train or observing shunting of such wagons. With thunder and lightning occurring in the distance, this prompted an unplanned turnaround back to Axedale. Nearing the Park, and having walked for about one hour, it was most likely the thought of a coffee at the Axedale Tavern that quickened the return walking pace! Even though it had rained, all the members enjoyed the scenery and how well the trail was maintained. The group also came across a couple of cyclists while on the trail, who cheerfully shared the path with the walkers. 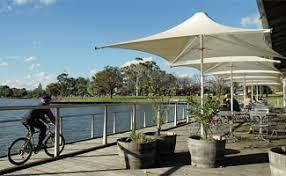 More information about the U3A Bendigo Inc can be found on their web page. Thinking about cycling or walking a rail trail, yet wondering which one? Wanting to know what other trail users comments are about a trail that you are considering? The Uncool Cycling Club is one such reference that shares the experiences of author Helen Dominish, for trails located in most Australian States. The review of the O’Keefe Rail Trail in June 2017, as posted, shows a number of aspects and points of interest of this increasingly popular trail. 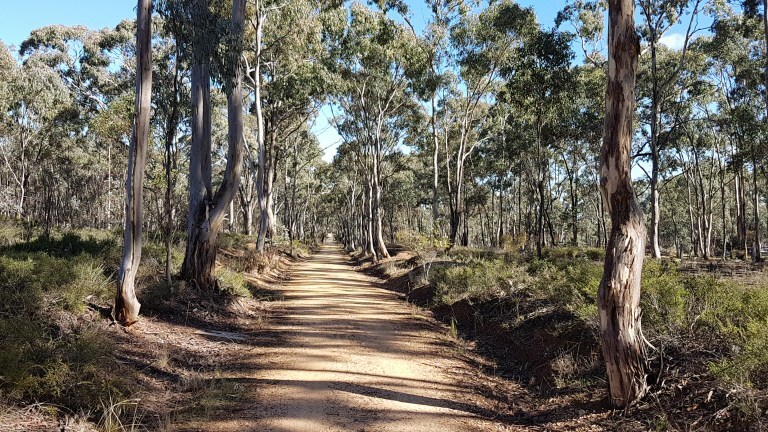 As well as this positive trail experience, the Uncool Cycling Club also posts reviews of other trails in the central Victorian area, such as the Castlemaine to Maldon Trail, the Murchison (Waranga) Rail Trail, Ballarat Skipton Rail Trail, and the Great Victorian Rail Trail. Unreviewed trails in the Bendigo city urban area, to be considered for inclusion when selecting trails to explore, are The Bendigo Creek Trail, the Back Creek/Spring Gully Trail, the Long Gully Trail, as well as the Bendigo Bushland Trail and the Goldfields Trail (Victoria). Of course as Victoria has the most rail trails of any Australian state, its not to hard to add other trails to the above options! NZ Seeks Out Aussie Trails! Have you seen this man riding in Victoria very recently, or perhaps you will in the coming days? This is Lance from Auckland New Zealand, who has come specifically to ride some of this State’s major trails. Having rode many of NZ’s amazing trails, on both islands, it was time for Lance to do some of the Aussie trails. Once reaching Heathcote, he would next be riding certain country roads to Tallarook, his starting point for the Great Victorian Rail Trail though to Mansfield. The plan for this outdoor adventurer would be to then cross the Yarra Ranges on roads to Warburton, there linking with the Lilydale-Warburton Rail Trail. 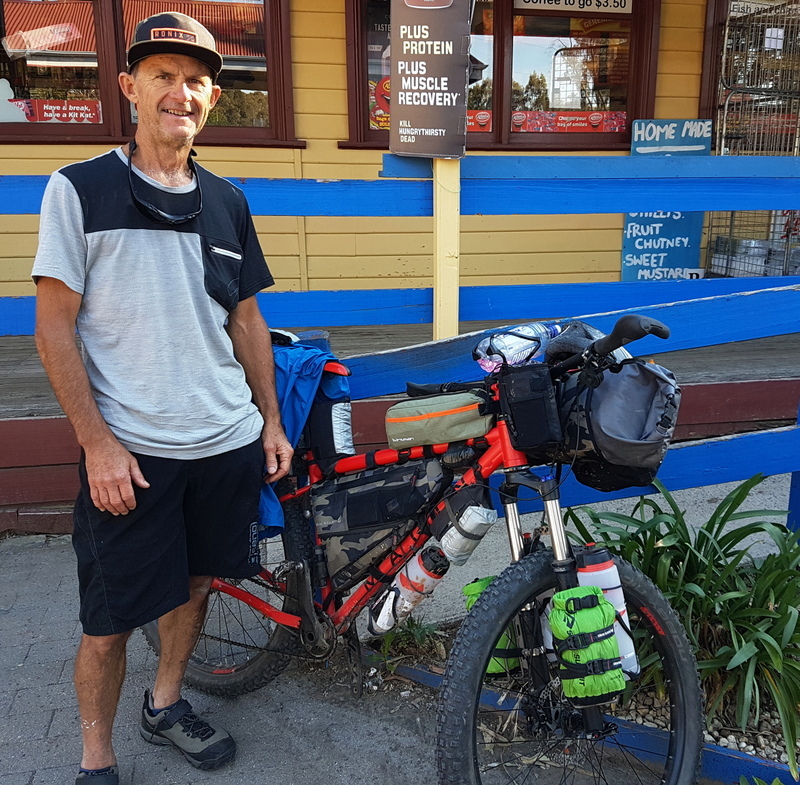 Once at Lilydale, Lance planned to catch a Metro train, and then onto Melbourne Airport to fly back to NZ, so completing his Aussie (Victorian) trail adventure this time. There was a hint that he just might be back, perhaps after his plans to ride the Trans Canada Trail next! The O’Keefe Challenge certainly gained support from both runners, walkers and cyclists over the April event weekend. While the running events, such as the marathon and half marathon attracted record entries, a new cycling event was conducted for the first time in 2018. ‘Light The Trail’ was a cycling event held on the Friday evening of the popular event weekend. 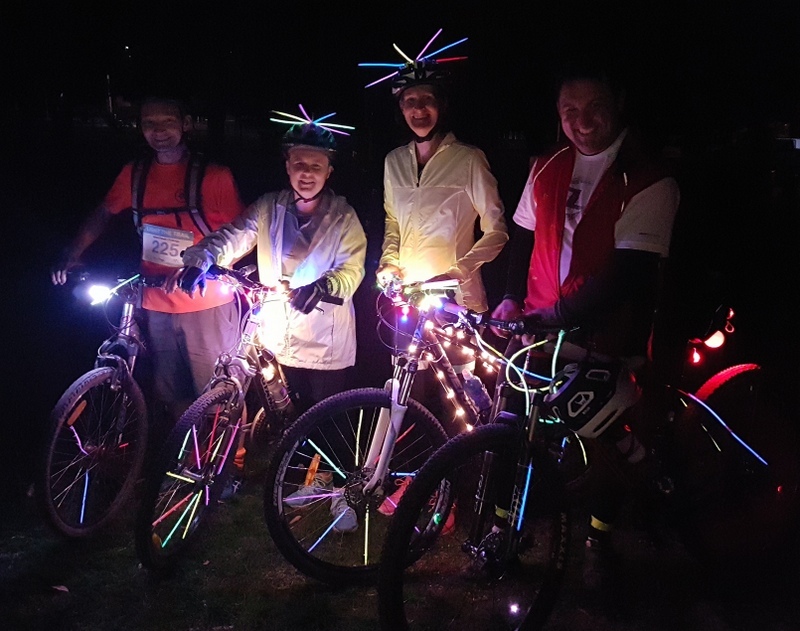 With this event commencing in Axedale at 7pm, cyclists were encouraged to also ‘light up’ themselves and their bikes with coloured decorative lights. 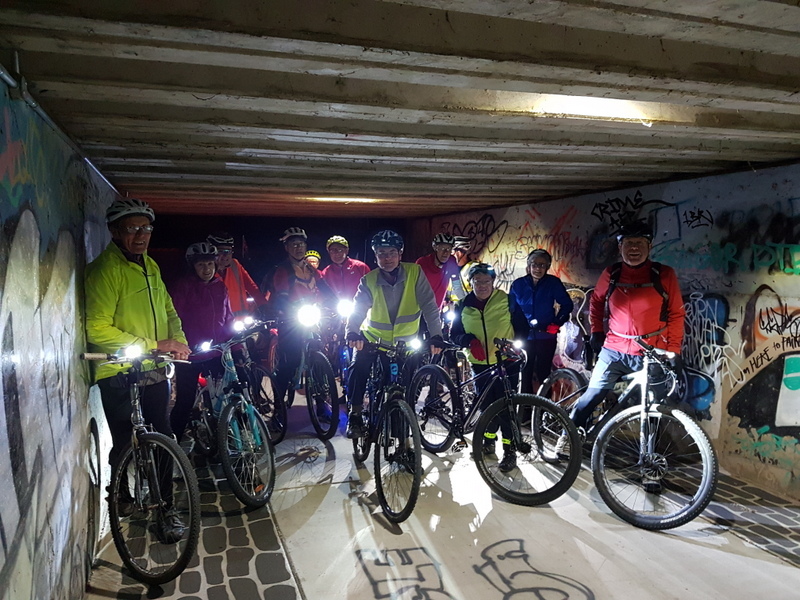 The route followed the O’Keefe Rail Trail from Axedale to Heathcote’s Barrack Reserve, a distance of 27.6kms, with cyclists relying only on their bright bike lights to see the trail ahead. While not a race, the lead riders did cover the distance in under 1hr 15mins, while most riders just enjoyed a more leisurely pace! A light supper was available for all riders at the finish, as well as a free bus with bike trailer providing transport back to Axedale. And yes, there were some riders who decided to ride the rail trail back to Axedale later that evening ……perhaps to gain just a little more of the great experience that the night event had provided! 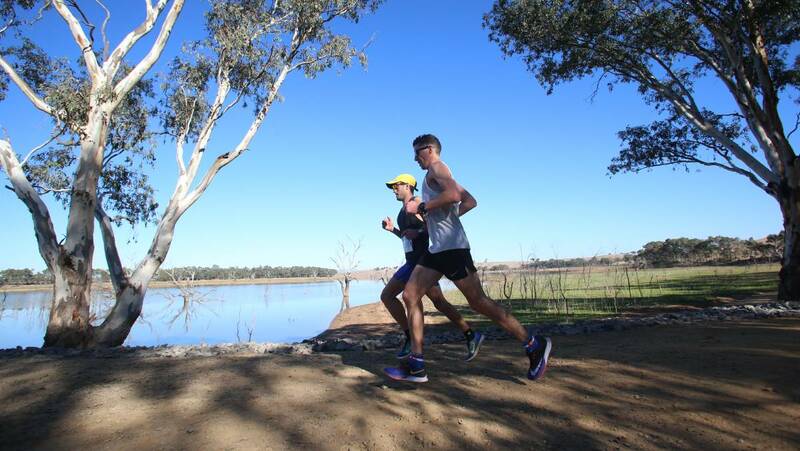 The third O’Keefe Rail Trail Marathon community organised events attracted 800 individual runners on Sunday 22 April, utilising various sections of the O’Keefe Rail Trail as part of the O’Keefe Challenge. The marathon event attracted 114 runners, starting in Junortoun, and 120 entered the half marathon commencing in Knowsley, whilst other participants entered in the 5km, 10km plus the other running and walking events starting in Heathcote. Bendigo athlete and former triathlete Leon Griffen won the marathon, in a time of two hours and 35 minutes, being a credible time compared with the marathon world record of two hours and two minutes. 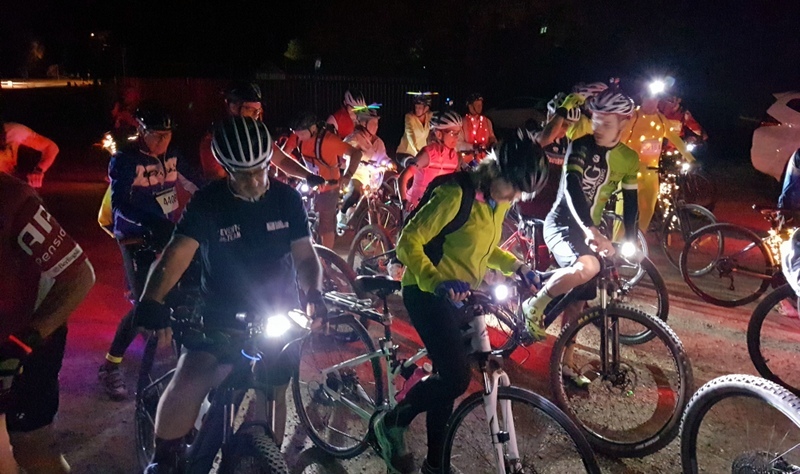 For the first time a ‘Light the Trail’ cycling event was a lead in event on the Friday night, using the O’Keefe Rail Trail and only bike lights. This event proved popular, starting at Axedale and finishing in Heathcote. The O’Keefe Challenge, its all about timing! There is still time to register for events this weekend being held on the O’Keefe Rail Trail, yet you need to be quick!! Take on The O’Keefe Challenge, by either running, walking or cycling on the historic O’Keefe Rail Trail. The first cycle event, ‘Light The Trail’, is on Friday April 20 starting at 7pm. All the other events are on Sunday 22 April when Heathcote comes alive! The Bendigo community’s love of cycling has helped it to snare an award not made to a city outside of the United States, until now. The Greater Bendigo has become the first community in Australia to become a Bicycle Friendly Community, accredited by CycleLifeHQ. Bendigo’s silver accreditation recognises Bendigo’s community engagement and bicycle education, the inclusion of bicycle facilities as part of road infrastructure projects, maintenance of off-road cycling facilities and the integration of bicycle planning with community facilities. 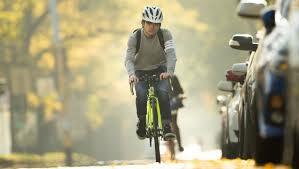 The Bicycle Friendly Community accreditation program has been run in the United States for more than two decades by the League of American Bicyclists, with more than 430 Bicycle Friendly Communities recognised in the USA. Bendigo will also host two major cycling conferences in 2018, cementing its reputation as a leading bike-friendly destination. In October, Bendigo will host the Australian Walking and Cycling Conference and the Bicycle Tourism Conference sponsored by CyclelifeHQ, both of which have never been hosted in Victoria before.